Our hand made canvas stretcher bars are of an exceptional quality, and come in a variety of sizes for you to make up at your convenience. 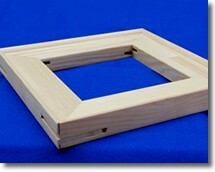 Non-warp laminated softwood frames are used on all our canvases up to 250cm. A 6 mm beading lip raises the canvas fabric away from the frame and this eliminates creases. The thickness of the wood with beading is 36 mm (1.5 inches), a very suitable depth for canvases of this size. All Canvas stretchers come in precision cut kit form with wedges for simple assembly. Extra cross-bars will be added if needed, to make the frame much stronger. This is to prevent the canvas warping in any way. Stretcher bars are available from stock and should be dispatched within 2 – 3 working days. You will be contacted with a delivery date prior to dispatch.